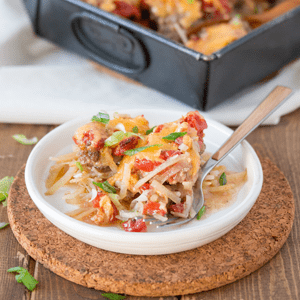 A bit like digging into your favorite burger and fries, this Cheeseburger Casserole is a simple way to switch up your bunless go-to. 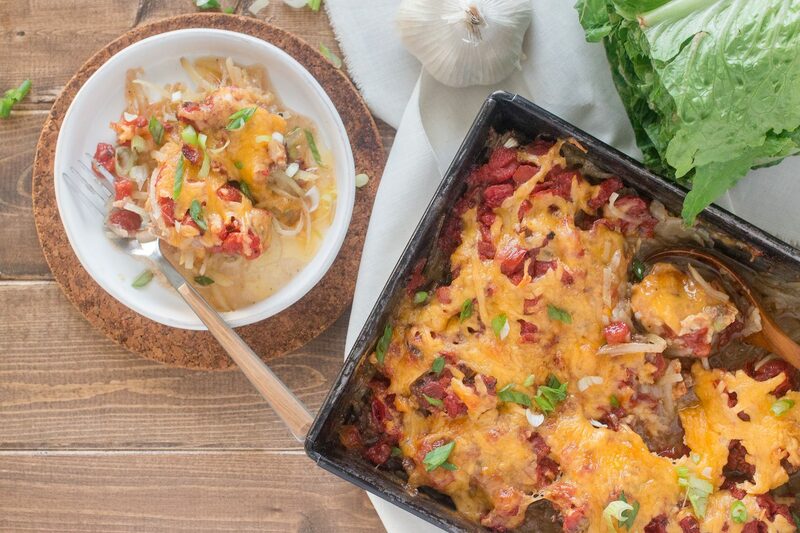 Potatoes layer in with all the usual suspects — tomato, mustard, onion, and ground beef. Personalize it with green chilis or jalapeños, as you like. Preheat the oven to 350F. Have read a greased 9×13 baking dish. Rinse the shredded potatoes in cold water until the water runs clear, about 3-5 minutes. Dry the potatoes with a dish towel and add them to a large bowl. Toss with 4 oz. of the shredded cheddar cheese and pour into the 9×13 baking dish. Spread it out along the bottom in an even layer and press it down gently. Add the diced tomatoes, shredded onion, mustard, coconut aminos, oregano, cumin, sea salt, black pepper, and Beef Gelatin to the large bowl. Stir well. Add the ground beef and continue to stir until well mixed. Pour the beef mixture into the pan over top of the potatoes. Spread it out into an even layer. Spread the remaining 4 oz. of shredded cheddar over top of the meat layer. Cover the baking dish with aluminum foil. Bake for 30 minutes. Remove the aluminum foil and bake for another 15-20 minutes, or until the cheese is bubbly and golden. Allow the casserole to cool for 15 minutes before serving. To personalize this recipe, add your favorite burger toppings — chopped jalapeños, green chilies, or sliced mushrooms — directly to the meat mixture before layering.